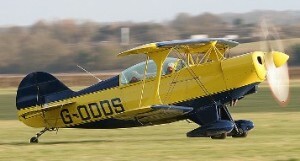 This aerobatic flight experience takes place in a Pitts Special. Being in one of these aircraft is a totally different experience. This has the potential to be a serious roller coaster ride but of course you have the choice of how ‘mild or how wild’ you would like your flight to be. We have a team of renowned world class aerobatic pilots including Emily Collett the British Advanced National Champion in 2016. Based at White Waltham, this highly experienced team offer aerobatic flight experiences in the Pitts Special. This is a fast and powerful aeroplane with the ability to carry out some acute aerobatic manoeuvres such as barrel rolls, loops, wingover and stall turns. Minimum height is 1.4 metres/4’8″ and the maximum weight is 14st/89Kg.